The day is getting nearer and nearer. So here are some updates of our room renovation. We are not sure was it because of the contractor? / ID? 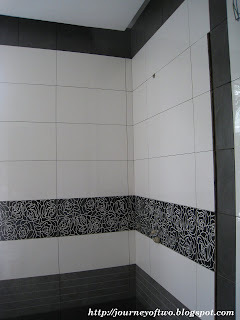 mistake in calculation the tiles, some of the tiles work are not completed yet. Some of you might ask can the reno be completed in time? We are sure it can be done. Don't worry. 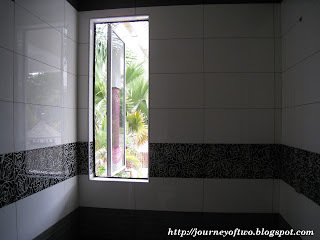 The bathroom. We are using the black and white concept. 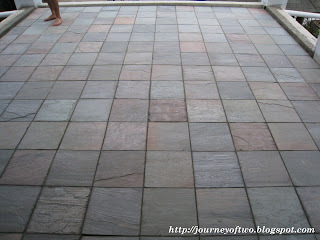 We chose slate tile for our balcony's flooring because of its beautiful natural stone, durability & also feels cold to walk on if you are barefoot! I wasn't feeling well on last Monday & Tuesday. It was even more torturing when I'm suffering from sleep disorder as well. I must admit that I can fall asleep very fast the moment I'm on the bed. But I do not enjoy the luxury anymore. I have been rolling on my bed till 3-4 in the morning. Even I managed to sleep, it was not a peaceful one at all. I was awake many times in between. I really can't tolerate it anymore till I requested for half a tablet of sleeping pill to aid for this sleep disturbance. When I spoken to my friends & SIL, they told me that I must be stressed up with my coming soon wedding day. Hmmm....... Am I? Maybe or partly I guess. Anyway, I had a good sleep for the past 2 nights. Maybe because a pig was with me, I could slept more soundly & peacefully. Wonder what will happen tonight without this lovely pig? Hopefully I will have a good sleep tonight. Wish me luck! I am a aromatherapy lover. I love the psychological and physical benefits of essential oil. Hence, with the recommendation of my friends & beautician, I have tried out a series of Decleor skin care products. Partly, I also wanted to have a much glowing & healthy complexion during my wedding day. 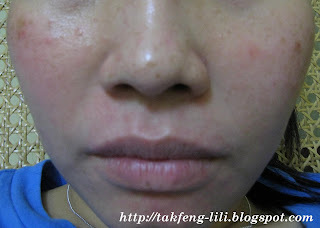 However, as soon as one week after the use of the products, I encountered allergic reaction. 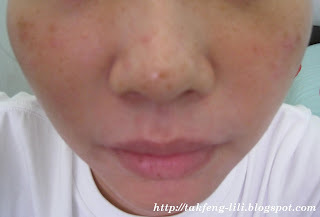 A red patch of skin appeared on the side of my nose, cheeks, forehead & around my mouth. It swelled mildly sometimes. Initially I thought it was caused by the sunburn effect during my trip to Dungun. So, I went to do a facial to calm the skin down. It did help a bit but one day later, the same problems occurred again. I went back to the beautician again & she reassured me that this is only a transition period. 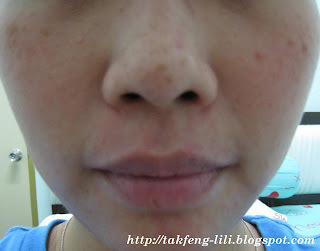 Their products are working & it actually penetrated deep into my skin layer. 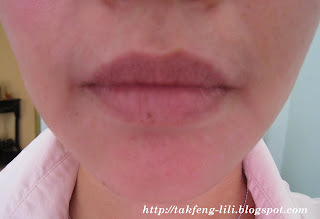 It helped to detoxify the previous products that I have used. Ok. I accepted & I continue living with all my Decleor products. Weeks after weeks, my skin is still not recovered yet. My doctor even prescribe a 5-day course of steroid therapy for me. I also self-medicated with anti-histamine medicine & steroid ointment as well. 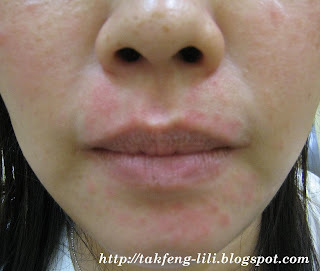 Unluckily, this severe form of atopic eczema is so annoying with more flare-ups that last for several weeks and the inflammation covers many areas of my face. "Wake up, Stephanie! You need to do something with your skin allergy! Your wedding is coming soon." So I went to consult Dr. Lee CM during my mum's medical check-up. He confirmed that it was a atopic dermatitis. He has asked me to stop using my Decleor products & has prescribed a 10-day course of Aerius to me. My face recovered from the allergic reactions after 2 days of the medication & I have also switched back to my previous skin care product, Cellnique. I have learned a lesson from this bad experience. To the bride-to-be, please do not follow my foot steps ya. Luckily, my friend is kind enough to buy all my Decleor products. 22-Jun: 3 weeks after using the products. 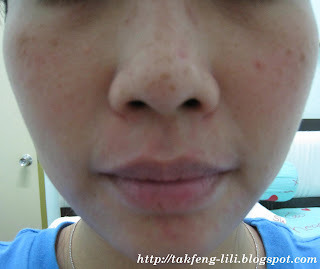 24 Jun: 1 day after steroid treatment. 27 Jun: Flares up & decided to discontinue with steroid due to side effects. 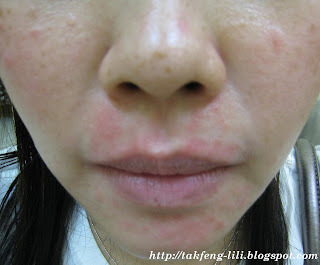 1-July: Stop the products completely on 30-Jun & has just started the anti-histamine, Aerius therapy. 2-July: The drug effect is pretty fast. However, there was a mild flare-up in the evening. 4-Jul: Recovered completely. Bye Decleor!